Finding the right tempo with his breakthrough Whiplash, director Damien Chazelle then made a musical lover out of me (that’s no small feat) with La La Land. Now he embarks on a down-to-earth biopic, exploring the man behind one of history’s ultimate firsts. Based on James R Hansen’s book First Man: The Life of Neil A Armstrong, the film follows the turbulent years that led to the Apollo 11 moon landing in 1969. 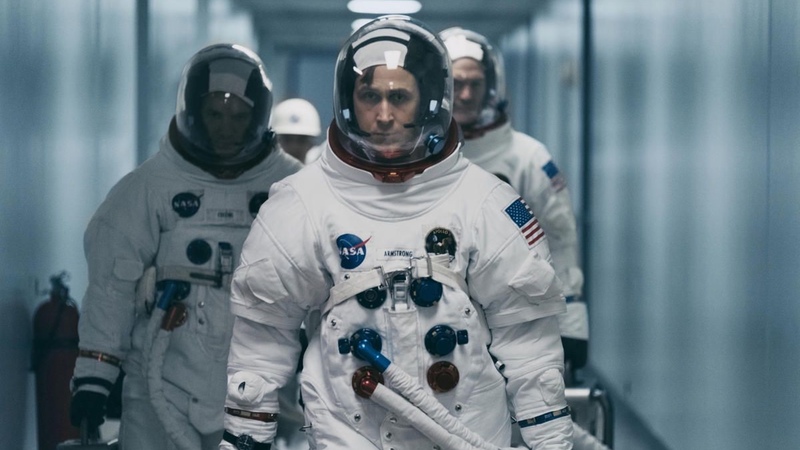 With First Man’s inevitable main event, both Chazelle and writer Josh Singer still manage to earn those final iconic scenes by stressing the perilous route to it. From claustrophobic and rickety space crafts that emit a sense of imminent doom as their thick doors are slammed shut. To the many distressing and sometimes frustratingly avoidable casualties along the way. However, the film’s core isn’t entirely focused on outer space accomplishments. While the American flag casually sits in the background (much to the dismay of some), our eyes fix on Neil Armstrong (Ryan Gosling) and the emotional baggage he’ll forever be carrying, even to the moon. He’s cemented in history and has reached parts of the galaxy we can barely comprehend but the unbearable loss of his young daughter Karen is at the centre of Armstrong’s universe. Armstrong’s home life is intimately captured by cinematographer Linus Sandgren, whose use of handheld camerawork mimics a home video. Complimenting the film’s biographical nature and its spotlight on the soul behind the monumental achievement. From Drive to Blade Runner 2049, Gosling has perfected the introverted, muted type and as Sandgren’s lens steadies and pans out, Gosling’s Armstrong is silhouetted in doorways, halls and window panes as if he’s lost between dimensions. Detached but frequently the voice of reason when in the company of brash fellow astronaut Buzz Aldrin (Corey Stoll) and bluntly direct when sensitive questions are masked with sentiments. However, we do also witness a more accessible Armstrong. Bonding with his co-workers (which make future catastrophes all the more heartbreaking) over shared sacrifices and calmer moments of reflection with wife Janet (Claire Foy). 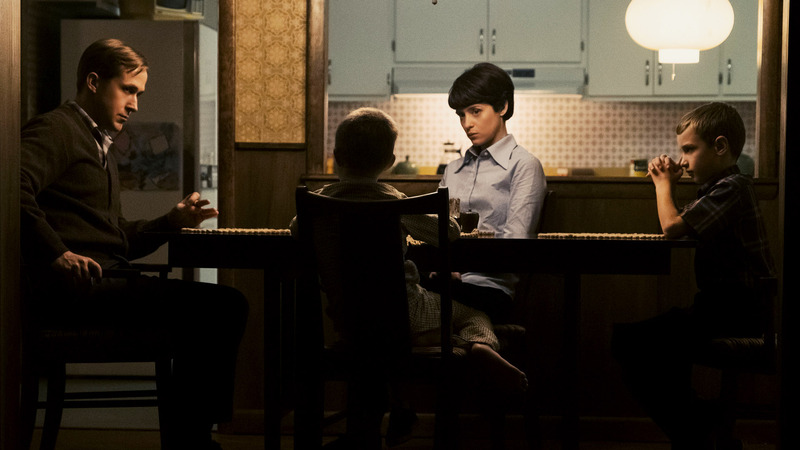 It’s Foy’s warm but resilient performance as Janet that anchors the entire film. Demanding answers from her husband’s bosses and forcefully persuading her children to ask their father difficult questions. Which leads to a quietly amusing scene in which Armstrong treats a family discussion as a rigid press conference. Despite First Man’s very human touch, it also manages to be subtly rousing. From small glimpses of wonder with the horizon glistening in Gosling’s eyes. The film then builds to its grand finale in which its initial snug shooting style is abandoned for sweeping, awe-spiring visuals. Paired with the repetition of real-life Armstrong’s much-loved song Lunar Rhapsody, Justin Hurwitz’s score also intensifies. Evoking an overbearing sense of sorrow, thrilling triumph and finally poignant closure. All the while never forgetting the power of absolute silence. The moon landing feels secondary in First Man, resulting in a deeply personal and understated study of loss that leaves a lasting impact.